Please let us know as soon as possible if you will miss a lesson. We will do our best to reschedule you for a different day that week if you have to miss a lesson. If you are in a group lesson, it is important to stay current with the group you are sharing lessons with and not fall behind. We require a 7 day advance notice for a planned absence or no refund or rescheduled time will be given. Recitals are very rewarding. They provide the student with a goal to work toward. While recitals are meant to be a fun and enjoyable experience, we know there are some people for which the idea of performing in front of a group is enough to make them quit their instrument. 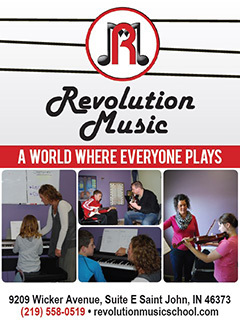 So, while Revolution Music strongly encourages participation in our recitals, they are not required. We will ask you to pay for course books that we use during the lesson. If I have extra copies of other music on hand,we will give them to you at no charge. DO YOU OFFER IN HOME LESSONS? In certain cases, we can accommodate an in home lesson if you are unable to travel to our location. Please contact Revolution Music for more info. HOW DO I ACCESS YOUR ONLINE MUSIC CENTER? Access is restricted to my students and parents. To register for log-in access, click “register” in the upper right hand corner of the home page. We certainly do teach reading, but we delay the process until the student has developed a confidence and breadth of experience of actually playing. If you think about the way we learned our first language, we began by learning to speak, developing a practical grasp of communication before the additional layers of complexity such as reading and writing were added. If you remove the complexity of deciphering the code on the page, you will be more free to establish a natural, musical relationship with the instrument, and will then be free to focus more fully on sourcing instructions from the page. We simply delay the reading process for a time. At my studio I offer Simply Music Piano in either shared lesson (small group) or individual format. While shared lessons may on the surface seem impractical, the dynamic, interactive format of our lessons actually allows a powerful, effective experience via its application of multi-sensory, receptive and generative learning strategies. At the same time, they are fun and cost-effective and allow students the opportunity to experience playing for and learning from their peers. IF I DON'T HAVE A PIANO OR KEYBOARD, WHAT SHOULD I PURCHASE? The best option even for beginning students is to regularly practice on an acoustic piano that is well-tuned and well-maintained or on a high-quality true digital piano, rather than a less expensive keyboard. This helps students establish good habits and understand the real “feel” of piano playing from the very beginning. The Yamaha Arius YDP161 is one great example. Another is the Yamaha Clavinova CLP. It is possible for beginning students to start on an inexpensive keyboard and then transition to a better instrument as they progress. The keyboard should have at least these features. For Simply Music lessons, the keyboard must meet at least the first three requirements. If it meets all the above requirements, your keyboard will feel more like a real piano, so it will serve longer as your child progresses. WHY DON’T PLAY-A-STORY STUDENTS BEGIN BY LEARNING SONGS THEY KNOW? When you think about it, the language we use every day is improvisation. We are constantly, naturally and effortlessly combining words and grammar in new ways that are completely spontaneous. What better way to have young children develop a comfortable relationship with music than to give them a simple framework and let them freely explore their musical imagination? They will be more likely to experience music as an extension of themselves and remain in touch with their creativity even after learning the ‘rules’.